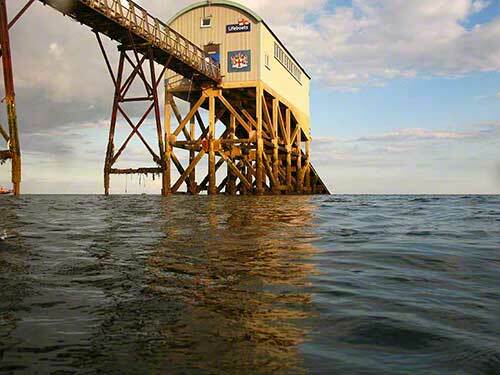 Selsey Lifeboat Station (50° 43.673′ N 0° 46.738′ W) was situated on Selsey Bill the western headland of West Sussex that is the county’s most southerly point. As a hard structure it provided suitable habitats for encrusting marine organisms as well as an area for fish and other life to gather. Despite its small size there was a rich and diverse fauna associated with the area with in excess of 100 species recorded by divers. Its location in the west of the county means that more westerly distributed species could be found here. In addition to the lifeboat station’s supporting metalwork provided habitats the seabed is also rich in life. Selsey Life Boat Station view SSE at low water slack. The gently sloping seabed starts as a fringing shingle beach which grades into sand with shingle and cobbles, however a dominant feature is the masses of slipper limpets, Crepidula fornicata (see http://www.marlin.ac.uk/speciesfullreview.php?speciesID=3086), an introduced species from the Atlantic coast of eastern USA (see http://en.wikipedia.org/wiki/Common_slipper_shell ) that arrived in British waters in the 1950s and has proven highly invasive. The mixed sediment and slipper limpet biotope (see http://en.wikipedia.org/wiki/Biotope ) has its own diverse range of species. The location of the site meant that strong tidal current occur. Although no longer there a the area can be dived, see Mulberry Divers. For best visibility and safety dive the site on the slack three hours after high water; for slightly less good visibility it can be dived on the slack four hours before high tide. For tide times see Tidetimesuk. . If you wish to dive this site it is a good idea to contact Mulberry Divers. A gallery of images can be seen here. Anyone wishing to provide further information, species or images (duly acknowledged and copyrighted) should contact me. Selsy Life Boat Station Sussex Anemone – Diadumena cincta?